Published March 5, 2018 at 1:19 a.m. 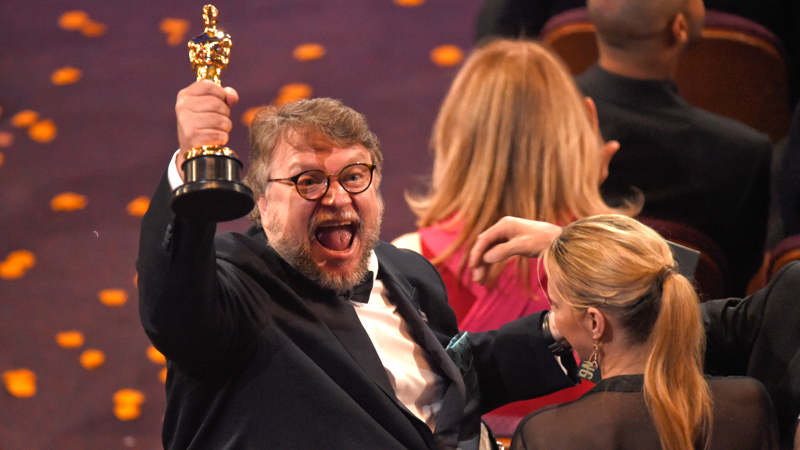 Updated March 5, 2018 at 1:19 a.m.
Guillermo del Toro’s lavish, romantic monster fable “The Shape of Water” swam away with best picture at an Oscar ceremony flooded by a sense of a change for a movie business confronting the post-Harvey Weinstein era. The ceremony, held Sunday at the Dolby Theatre in Los Angeles, exorcised some demons — like last year’s envelope fiasco — and wrestled with other, deeper problems in Hollywood, like gender equality and diversity. “The greatest thing that art does, and that our industry does, is erase the lines in the sand,” said del Toro. Jordan Peele won for his script to his horror sensation “Get Out,” becoming the first African-American to win for best original screenplay. Peele said he stopped writing it “20 times,” skeptical that it would ever get made. Things went expected in the acting categories, where Frances McDormand won her second Oscar for her performance in “Three Billboards Outside Ebbing, Missouri.” McDormand asked all the attending female nominees stand up in the theater. But many of the show’s most powerful moments came in between the awards. Ashley Judd, Anabella Sciorra and Salma Hayek — who all made allegations of sexual misconduct against Weinstein — together assembled for a mid-show segment dedicated to the (hash)MeToo movement that has followed the downfall of Weinstein, long an Oscar heavyweight. They were met by a standing ovation. Host Jimmy Kimmel opened with a monologue that mixed Weinstein punchlines with earnest comments about reforming gender equality in Hollywood. And of course, Kimmel — returning to the scene of the flub — dove straight into material about last year’s infamous best-picture mix-up. Several cinema legends won their first Oscar. James Ivory, 89, won best adapted screenplay for his script to the coming-of-age drama “Call Me By Your Name,” becoming the oldest winner ever. After 14 nominations, revered cinematographer Roger Deakins finally won for his photography on “Blade Runner 2049.” In the category, Rachel Morrison (”Mudbound”) became the first woman nominated for best cinematography. The ceremony was the crescendo of one of Hollywood’s most turbulent awards seasons ever — one that saw cascading allegations of sexual harassment topple movie moguls, upended Oscar campaigns and new movements launched to improve gender equality throughout the industry. No Golden Globes-style fashion protest was held by organizers of Time’s Up, the initiative begun by several hundred prominent women in entertainment to combat sexual harassment. Their goals go beyond red carpets, organizers said in the lead-up to the Oscars. “We did the dress code thing and now we’re doing the work,” said (hash)MeToo founder Tarana Burke on the red carpet. December 8, 2017 12:05 a.m.